The season started off so optimistically for the Saints...and then the game began. Drew Brees got the team fired up with a pep talk about brotherhood and expectations and obligations. It might’ve been the last season-opening hype speech he ever gives them. After three straight 7-9 seasons, three straight lost season openers, and 1,351 days without owning a winning record, the Saints believed—hoped—wished?—this year would be different. It’s just one game, but it looked like the same-old-same-old. The new-look defense, which was supposed to be much improved this year, allowed Sam Bradford to throw for 346 yards, with just five incompletions. And it wasn’t as if that was a sacrifice required to sell out to stop the run: Dalvin Cook, in his NFL debut, rushed for 127 yards on 22 carries. The Saints’ offense, usually the saving grace, was entirely mediocre. Falling behind early and having to give up on the run (New Orleans backs settled for just 55 yards on the ground), Drew Brees aired it out, and finished with decent numbers: 27 of 37 for 291 yards and one TD, and his QB rating of 104.7 was good for seventh among Week 1 starters, though it was a particularly putrid week of quarterbacking. The offense looked particularly punchless after right tackle Zach Strief left with a strained MCL that’s going to keep him out for multiple weeks, and that’s bad news: The Saints’ early schedule is a tough one, hosting New England next week followed by road matchups at Carolina and Miami, and then after a bye, games against the Lions and Packers. There’s a very realistic path to a 1-5 start here, and another lost season. And after the season? Well, that’s when things will finally get interesting. 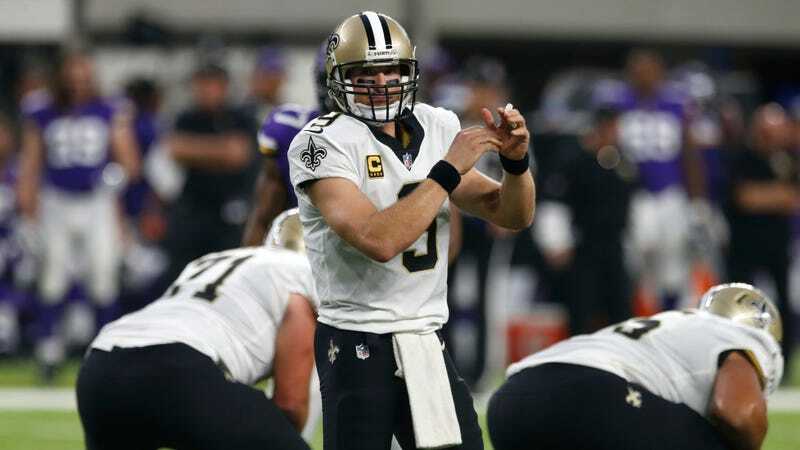 ESPN reported this weekend that Drew Brees’s contract contains a rare clause that prevents the Saints from using the franchise tag on him. Brees could certainly re-sign in New Orleans. He is the franchise and has been for a decade. But he’s also been the reason the Saints have been trapped in salary cap hell for years. To keep re-signing Brees, the Saints have gotten increasingly creative with his contracts, effectively kicking the cap crunch down the road. (In 2016, for example, for Brees to have only a $17 million cap hit, he needed to carry $54 million in dead money.) But the piper has to be paid. If Brees and the Saints part ways this offseason, he’ll still count $18 million against their cap next year. Either way, all that looming dead money hamstrings the Saints’ abilities to sign other players to long-term deals. It’s a big obstacle to getting sustainably better, and to signing cornerstone players on either side of the ball. Brees will want to be paid next year, wherever that is, and he deserves it. With the likes of Derek Carr and Matt Stafford inking deals that will functionally pay them more than $28 million a year, Brees is in for a significant raise, even if at age 38 it would likely be for just a couple of years. The franchise tag for a quarterback in 2018 is expected to be around $24 million, so slapping that on Brees would represent a discount for New Orleans—but that’s off the table, thanks to the clause in Brees’s contract. The Saints may well decide this team will be better off letting him walk, and finally entering a real rebuild. And that’s probably the smart play: A “win now” strategy is pretty self-defeating when, for the fourth year in row, the Saints likely aren’t going to win. The rebuilding—and the reckoning with Brees’s dead cap hit—is coming. There’s no way around it. The only question is when. By letting him play out the final year of his deal, both the Saints and Brees are sending indications it’s coming very soon. Adrian Peterson Wanted To Run It Up The Vikings&apos; "Donkey"